In 2017, Foxconn, the Taiwan–based company that assembles about 40 percent of all the consumer electronics in the world — from iPhones to PlayStations — promised to build a 12.5 million-square foot LCD fabrication plant in Mount Pleasant, Wisconsin, “big enough to hold 11 Lambeau Fields.” Wisconsin’s governor at the time, Republican Scott Walker, gave Foxconn $4.1 billion in subsidies and exemptions from environmental regulations, while Foxconn chairman Terry Gou promised a $10 billion investment in factories and between 3,000 and 13,000 jobs. The deal never made much sense for Wisconsin; Wisconsin would be spending between $220,000 and $1 million per job, the most money ever paid to a foreign company to bring in jobs, with the nonpartisan Legislative Fiscal Bureau saying the soonest Wisconsinites could potentially see a return on their Foxconn investment would be in 2042. Still, if everything had gone according to plan, the LCD factory Foxconn would build be the largest in the U.S. by headcount. U.S. But everything has not gone according to plan. Foxconn has continuously scaled back its ambitions. It originally planned to build large-screen LCDs at a state-of-the-art Gen 10.5 LCD fabrication plant. Then it said it would instead be building a smaller Gen 6 LCD plant, something called the Wisconn Valley Science and Technology Park (not a typo, just a groaner of a pun), and an “AI 8K + 5G ecosystem” (which reads like a bundle of tech buzzwords thrown together like refrigerator-magnet poetry). Now, according to Foxconn’s Louis Woo, the company won’t be making any screens in Wisconsin at all. “In Wisconsin, we’re not building a factory. You can’t use a factory to view our Wisconsin investment,” Woo said in an interview with Reuters. “In terms of TV, we have no place in the U.S. We can’t compete.” Instead, Foxconn says it will now build “technology hubs,” with jobs in R & D and design, jobs Woo described as “knowledge” positions. Milwaukee and Madison, which both have a greater number and higher percentage of college graduates than Mount Pleasant, stand to gain whatever jobs do materialize from the Foxconn deal. Meanwhile the county of Racine, where Mount Pleasant is located, has taken on hundreds of millions of dollars in bond debt to build out roads and infrastructure to support the Foxconn factory it was promised. Foxconn has pulled this bait and switch before. In Harrisburg, Pennsylvania, the company promised to build a $30 million plant and bring in 500 jobs in 2013, earning it major headlines and a lot of hope in a region of Pennsylvania that’s been hollowed out by the loss of manufacturing work. But the factory never materialized — when the Washington Post investigated, the only Foxconn workers it could find were in a half-staffed building in Harrisburg with about 50 administrative employees. Similar results were seen in Vietnam, where Foxconn committed to a $5 billion investment in 2007, and in Brazil, where Foxconn spoke of a $10 billion plan in 2011. The company made its first major foray in Vietnam only last year. In Brazil, Foxconn has an iPhone factory, but its investment has fallen far short of expectations. So why does Foxconn consistently overpromise and under-deliver to governments? For Foxconn, there’s little risk in making big promises; when it actually does build a factory, the jobs transform the surrounding region, so even if it reneges on an initial promise, it can likely go back to a government and try again a few years later (potentially with a different administration in office). Foxconn was also dealing with President Trump, for whom “China is screwing us” was a campaign plank. A promise to bring manufacturing jobs to the U.S. put Foxconn in Trump’s good graces. Trump had also made it clear that he was eager for manufacturing jobs of any sort, meaning the U.S. would enter into any negotiations on its back foot. In fact, Trump helped Foxconn shop its factory around to various states in the Midwest, allowing the company to find the state that would give it the sweetest deal. For politicians in a region in which manufacturing jobs are scarce and highly desired, a Foxconn factory was tempting — many states made offers, but none were such bald giveaways as Wisconsin’s. But anyone with even a passing knowledge of the economics of manufacturing should have known that Wisconsin was never going to produce LCD screens (including with Foxconn). “It was a project that just didn’t add up,” says LeRoy. “There’s no supply chain, because nobody has ever made that product in the Western hemisphere. And even if they build it, it was gonna be what we call a ‘screwdriver shop’ that was going to take components made in Asia and then slap them together here. In the long run, that’s not how you build a tech cluster.” For an assembly plant to be a true economic driver, it can’t just be a place where products are assembled; it needs nearby companies making the parts that are being assembled, as well, employing even more workers and creating more tax revenue. Once a factory is up and running, one of the main concerns is troubleshooting. Say that Foxconn had followed through on its initial promise, and built a major LCD screen fabrication plant in Wisconsin. LCD screens require a number of components that would have to be assembled offsite, like display glass, drive and control circuit boards, and power supplies. If the manufacturer suddenly discovered that a significant portion of the LCD screens were being produced with defects, the problem might lie in the components. A factory in China experiencing problems due to components might need to shut down for only a few hours or a few days, while a factory in the U.S. would likely be offline for weeks or even months. Part of this is due to the fact that in China, a supplier might only be a few hours away, as opposed to 27 hours away, by plane, as from Shenzhen to Milwaukee. More importantly, if a significant number of components need to be shipped to fix a problem, the only economical way to do so is by boat, meaning 40 to 70 days of travel time. It’s like trying to assemble an Ikea couch in your living room while keeping all the individual parts at a storage locker across town. It can be done, sure, but it’ll take a while, and God help you if you think maybe you’re missing that vital screw that’ll get your couch to stay together. A recent story in the New York Times shows how difficult it can be to manufacture consumer electronics in the U.S. In 2012, Apple began to manufacture its high-end Mac Pros in Austin, Texas. But production was consistently stymied by the dearth of custom screws needed to assemble the Mac Pro. At its Texas factory, a team of 20 could only turn out 1,000 screws a day, severely hampering how fast computers could be manufactured. In the end, Apple just ordered the specialized screws from China. Other efforts to manufacture electronics in the U.S. have been similarly complicated. Dell opened a computer manufacturing plant in Winston-Salem, North Carolina in 2005 (snapping up bountiful tax incentives along the way), but closed the plant just four years later, laying off 905 workers. Chinese-based computer maker Lenovo opened a small manufacturing plant in North Carolina in 2013, but it mainly refurbishes computers and provides customer support. Element Electronics, which had long touted itself as the only American TV manufacturer left standing, shuttered the doors on its factory in Winnsboro, South Carolina in August 2018, blaming the tariffs imposed by President Trump, and leaving the United States with zero mass-market TV manufacturers. There are a few bright spots. HP has three factories in the U.S., two outside Indianapolis making workstations and commercial desktop PCs, and a plant near Houston assembling servers (though all are run by Foxconn, and the larger of the two plants outside in Indianapolis has been reported to be a prolific user of undocumented workers, paying minimum wage, and using temporary workers). Intel has several microprocessor fabrication plants in the U.S. Samsung manufacturers some of its memory chips at a plant in Austin, Texas. American thumb drive manufacturer Patriot Memory produces products in a Fremont, California plant, in addition to in several plants in Taiwan. Some of this has to do with the appeal for manufacturers to be closer to their customers. If you make a bulky, heavy product, you may thereby save more on shipping and getting that product to consumers, even if you factor in higher labor costs and being further away from the Asian supply chain. But it’s a delicate equation: If your bulky item is also complex to make, you may see whatever savings you get from proximity to customers evaporate because it’s more expensive to troubleshoot and get the precise parts you need. There are manufacturing sectors where the U.S. can and does compete. America assembles more airplanes than any other country in the world (though, increasingly, most of the components for the planes come from overseas). Both Whirlpool and KitchenAid brought their factories back from overseas to manufacture in the U.S. Corning, which makes the Gorilla Glass used in iPhones and produces a good deal of the glass used in smartphones overall, has 29 factories in the U.S., in addition to numerous factories overseas. There is an intense desire for manufacturing jobs in the U.S., among both politicians and citizens. It stems from American boom times in the 1950s, when American manufacturing ruled the world (mainly because a good chunk of the world was in ruins from World War II). But manufacturing jobs have been disappearing slowly, and then all at once. From 2001 to 2009, nearly one-third of all manufacturing jobs in the U.S. vanished, for reasons that are still debated, though most agree that China’s entry into the World Trade Organization in 2001 was a major factor. For the 60 percent of Americans without a college degree, manufacturing jobs represent the promise of higher wages and better benefits than low-skill service industry jobs. But giving away huge tax subsidies to companies like Foxconn will not bring those manufacturing jobs back. Promises will be made, sweetheart deals offered, and then the promises will be broken without consequence. 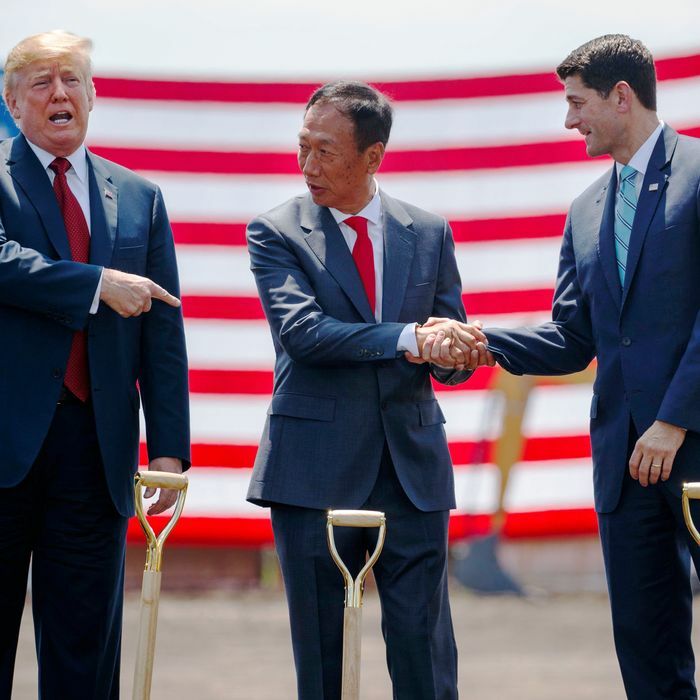 Just ask the citizens of Mount Pleasant, some of whom were evicted to make way for Foxconn’s vaporous factory, who now have the memory of a photo op with President Trump, Paul Ryan, and Foxconn chairman Terry Gou digging in the dirt, and one very large building with a very uncertain future.